Background and aim of the work : Coronary artery disease (CAD) is the leading cause of mortality in men and women. Acute coronary syndrome (ACS), is a major reason for hospitalization in our country. The great majority of ACS patients have at least one major risk factor. Dyslipidemia has been identified as one of the most important modifiable risk factors for CAD. 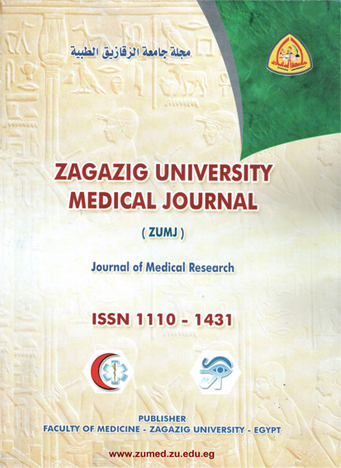 The aim of the study was to determine the prevalence and pattern of dyslipidemia , its relation to other modifiable risk factors in patients admitted with ACS to Medical ICU in Zagazig University Hospital, Egypt within a period of 11 months. Subjects and methods : The study included two groups; group one included 150 patients with ACS classified according to clinical presentation, the findings on the admission electrocardiogram (ECG) and the results of serial cardiac troponin levels, into myocardial infarction(MI), either ST-elevation or non ST- elevation MI, and unstable angina(UA) subgroups. The other group included 20 healthy subjects as controls. All subjects participated in this study were subjected to history, clinical examination routine investigations, lipid profile including total cholesterol (TC), high density lipoprotein (HDL), low desity lipoprotein (LDL) and triglycerides (TG) and lipoprotein (a) [Lp(a)] . Cardiac troponin and 12 leads ECGs were performed for diagnosis and follow up of the patients. The Lp(a) values were significantly elevated in diabetic and in smoker patients with ACS (p<0.05) while the high values in hypertensive patients were insignificant (p=0.167). Stepwise regression analysis of lipid parameters revealed that TC/HDL and TG/HDL ratios were independant risk factors for ACS. Conclution: Dyslipidemia is one the major risk factors which is widely prevalent in patients with ACS and is more prevalent in males than in females. High Lp (a) is widely prevalent amoung patients with ACS. specially those with diabetes mellitus and smokers. We recommend to pay more attention to serum lipids and other modifiable risk factors for prevention of ACS and more studies about Lp (a) as a risk factor of atherosclerosis and its impact on other systems is adviced.